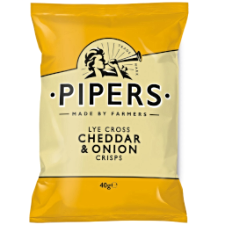 Pipers Crisps Lye Cross Cheddar & Onion available in 40g bags. Lye Cross, at the foot of the picturesque Mendip Hills near the Somerset village of Cheddar, has been farmed by the Alvis family for 400 years. The farm's herd of more than 1,000 cows graze the lush pasturelands to produce the rich milk that goes to make the cheese. The Alvis family combine new technology with traditional techniques that have been passed down through the generations of master cheesemakers, such as the age-old 'Cheddaring'. 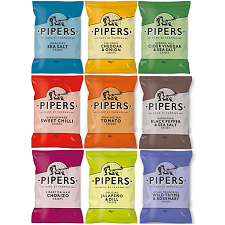 This practice of turning and stacking the curds by hand allows them to mature and develop the full, distinctive West Country farmhouse Cheddar flavour that goes into Pipers crisps.